During the late fifties and early sixties, Rolls Royce and BMC discussed some joint projects. One involved a smaller, less expensive Bentley. That idea was ultimately scrapped, but it was the seed for the Vanden Plas Princess 4 Litre R.
The Pinninfarina styled Vanden Plas Princess line had been around since 1959. In 1964 the body got a slight restyle. The tail fins were eliminated, giving the back end an almost Merdedes or Lancia look. (Depending on what angle you looked at it.) The front end remained very similar to the earlier cars. (The nose was later copied by Volvo for their 164) The biggest change in 1964 was the addition to the letter "R" to the name. That "R" meant that there was now a Rolls Royce engine under the hood (bonnet). The 4 liter Rolls Royce engine gave the car some decent power and, like all Rolls Royce engines was smooth running and quiet. The interior of the Vanden Plas Princess 4 Litre R featured everything you'd expect in a 60s British luxury car, including "picnic" tables. There were around 7000 of these cars made between 1964 and 1968. Supposedly 4500 of those were sold in the US, which is amazing considering its price and lack of name recognition in the US. The car being offered on eBay was imported from Germany. It has just under 37,000 miles on it. It appears to be on overall good condition with just a few rust spots and a non-functioning "front door latch". Based on the questions being asked of the seller, the interior, which is velour, seems to be of particular interest. Most, if not all, of these cars came with Connolly Leather seats. This one has either been reupholstered (which would make the car a little less valuable) or it was special ordered with velour (which would make it a little more interesting). Click here to see the eBay listing for this 1965 Vanden Plas Princess 4 Litre R.
The Vanden Plas Owners Club website can be found here. I bought a 4 liter Princess this July 2010. We towed it home From California to Grand Forks, MN with our Kia Sportage. The owners were really nice people and the car is waiting for restoration, wish us luck. It seems odd ball cars are filling up my garage space? We also have 1951 Kaiser, 1941 Cadillac, 1940 Cadillac, a TR7 and three Fiat X-19's. The TR7 has made the trip from Minnesota to the coast and back and is used for a daily driver for summer. The fiats all run, but need rust repair. One was walked on by a large bull, it always starts and is a blast to drive. 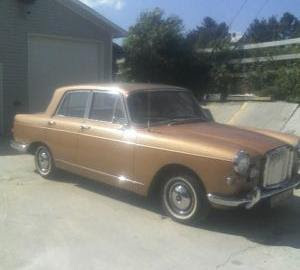 The Vanden Plas 4 liter R should be up and running for summer, hope it turns some heads at the car show? I plan to paint it in the spring. The Vanden Plas Princess was the only time that a Rolls-Royce engined powered a non Rolls-Royce car.